U.S. Government Continues to Fund Refugee Resettlement Non-Profit Whose Funding Has Been Frozen by the U.K.
U.S. Government Continues to Fund Refugee Resettlement NGO Whose Funding Has Been Frozen by the U.K. The government of the United Kingdom has frozen all payments to the International Rescue Committee (IRC), one of the largest non-profit refugee resettlement agencies in the world, pending the outcome of an investigation into allegations of “sexual harassment and fraud” in the organization. As one of the nine voluntary agencies (VOLAGs) that have for decades received about $1 billion annually from the U.S. federal government, the IRC is also heavily funded by American taxpayers. The IRC is the third VOLAG in the last six months to come under scrutiny for questions surrounding its leadership and management. Lavinia Limon, CEO of the U.S. Committee for Refugees and Immigrants, resigned mysteriously in October. In February, Linda Hartke, CEO of the Lutheran Immigration and Refugee Service (LIRS) was removed from her position by the board of directors three months after Breitbart News broke the story that an internal investigation of her management had been launched to examine allegations of harassment and financial mismanagement. The management and leadership of former U.K. Foreign Secretary David Miliband, who has served as CEO of the IRC since 2013 and receives an annual salary of $671,000, is now under serious question, and his ability to maintain his current job is uncertain. The State Department offered no indication that it intends to stop funding the IRC, despite the actions of the U.K government when asked specifically by Breitbart News if the U.S. government currently has plans to immediately stop making payments to the IRC to conduct refugee resettlement operations in the United States. “The Department of State takes very seriously the prevention and response of all accusations of sexual exploitation and abuse,” a State Department spokesperson told Breitbart News when asked if the U.S. government intends to follow the lead of the U.K. government in suspending payments to the IRC pending the results of an investigation. Since 2005, PRM has required that implementing partners have a Code of Conduct on Protection Against Sexual Exploitation and Abuse (PSEA), including appropriate mechanisms to train staff and investigate allegations. We also require training for PRM staff to monitor compliance by partners and understand their own responsibilities in upholding the same standards. When allegations of sexual exploitation or abuse are brought to our attention, we ensure that the organization is taking the necessary steps to appropriately address the issue. The State Department has not responded to this follow up question from Breitbart News: Now that the allegations of abuse against the IRC have been brought to the State Department’s attention, what specifically is the State Department doing to ensure the IRC is taking the necessary steps to address the issue appropriately? The turmoil at the largest VOLAGs in the refugee resettlement industry in the United States comes as federal funding of these groups has dropped dramatically under President Trump. As Breitbart News has reported, refugee admissions to the United States have declined from 84,995 in FY 2016, the last full year of the Obama administration, to 53,716 in FY 2017, three months and 20 days of which was under the Obama administration, to just 6,708 during the first four months of FY 2018 under the Trump administration. In September, President Trump announced that he was dropping ceiling for the number of refugees that could be resettled in the United States in FY 2018 to 45,000, but at the current rate the number of refugees resettled during this fiscal year is more likely to be around 21,000. As a consequence of these decreased number of refugee admissions, the VOLAGs, which are almost entirely dependent on federal funds, have closed numerous local refugee resettlement offices. The investigation into the IRC, at present, is limited to its operations outside of the United States. 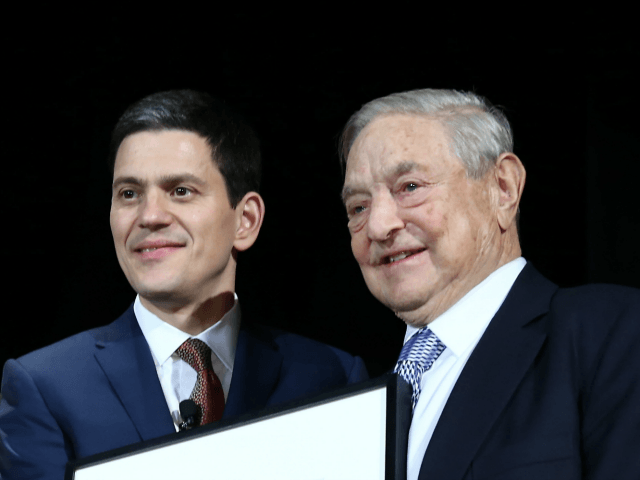 UK government ministers froze funds to the NGO, which is a major partner of globalist billionaire George Soros, “based on direct reporting of sexual harassment and fraud”, it was reported this week. With nearly five and a half million pounds of taxpayer cash at stake, a team from the IRC was sent to look into claims made over the body’s behaviour in the Democratic Republic of Congo. However, the IRC’s connections to George Soros are likely to heighten scrutiny of its operations here in the United States as well, at least among Members of Congress, who are expected to put pressure on the State Department to provide details of the federal government’s oversight of the IRC’s American activities. “The IRC is one of the charities closely-linked to George Soros’s push to drive aliens into European Union (EU) nations. Not only does the pro-migration body receive funding from the globalist billionaire’s Open Society Foundations, but Soros also selected the IRC to “create principles” that would guide the Hungarian-American’s $500 million “investment” in migrant-related initiatives he announced last year,” Breitbart London reported.